Can you say "bumper crop of peppers"? Yes, 2012 was the summer of the pepper. 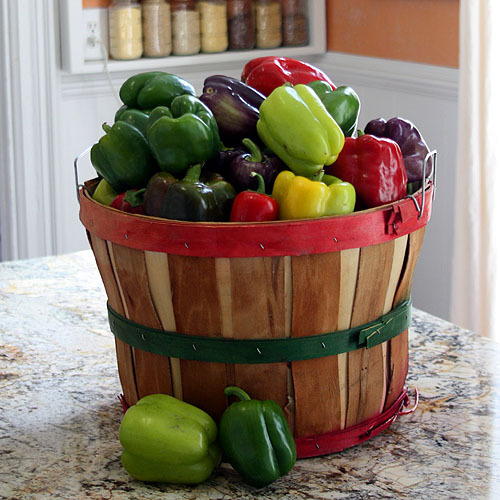 I harvested this lovely half bushel of peppers at Hawkins Farm. It's mostly wrinkly ones or ones with holes or other issues. The kind that aren't nice enough to go in the shares. And even after I picked these guys there were still tons more. Every plant of bell peppers has at least 10 peppers in various stages of development. The banana and hot peppers easily have twice that many. I hadn't wanted to freeze peppers. They weren't in my Plan to Preserve. But since they are prolific this year, I added them to my list. When I think of what a pepper costs at the grocery store, I can't help but feel giddy about having this many to put up for the winter. Right now a green pepper is 88 cents and red, orange or yellow pepper is $1.69. The organic peppers are more than twice that! These are even better local *and* organic. I probably have $100 worth of peppers right there. Four cups chopped pepper went into canned salsa and the rest I am freezing. Frozen peppers are not as good as fresh peppers for salads or other places where fresh is best. 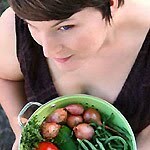 However, they are excellent for recipes where they get cooked like soups, egg scrambles and curries. Start by cleaning all of your peppers well. Sometimes there are included lobes that make it difficult. I just cut those open and scrub them out. Then I cut the pepper in half, remove the stem and seeds, remove any icky spots and cut into the size I want to use. Look at the recipes you make most in the winter to decide whether you want strips or cubes. I cut strips for pizza toppings, dices for soups, stews and scrambles and chunks for roasting and curries. You do not blanch peppers. 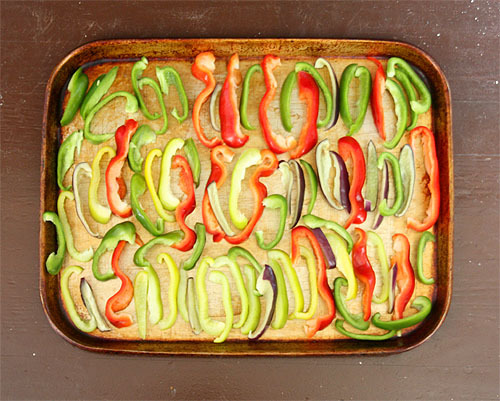 Next arrange your cut pepper onto a metal baking sheet in a single layer. It is important that the tray and the peppers are dry. Extra water will make prying the frozen peppers off the sheet a trial. 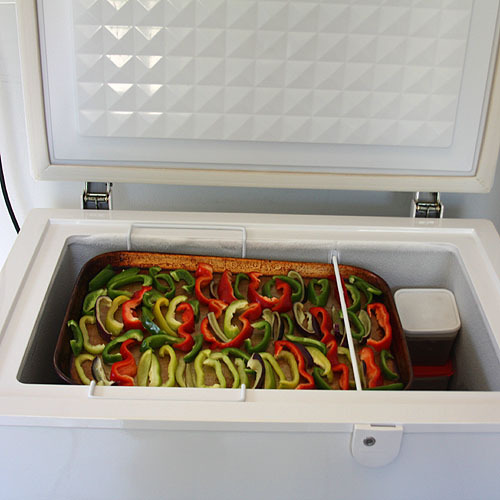 Then put the tray of peppers flat into the freezer. Make sure you can fit your tray into the freezer first. I balance mine on top of the sliding basket thing and it has to go under a metal divider bar thing too. Several hours later the peppers will be frozen solid. Use a spatula to scrape them off the tray quickly and put them into a zip top bag before they defrost. Label the bag with the date and note if they are sweet or hot peppers. Then put them back into the freezer and they are ready to go when you are cooking. Pretty easy, no? The process is the same for hot or sweet peppers. However, if you are working with hot pepper wear latex gloves. I didn't realize one of the peppers was hot. I thought it was a banana, but it was a Hungarian wax. An hour later my fingers were burning from the capsaicin oil. I washed my hands well with dish soap and then used a scrub of one part olive oil and one part white sugar to remove any remaining hot pepper oils. In about an hour the tingling was gone completely. And as a bonus, my cuticles were the cleanest they have been this growing season! What do you have for a bumper crop this season? 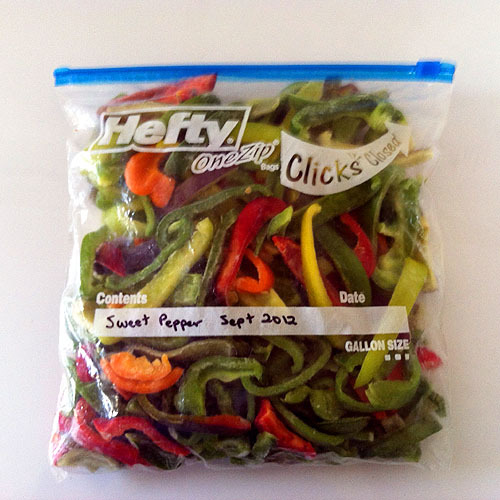 I have never tried to freeze peppers, but we too have more than we can eat this season, thanks for your tips! I too have never frozen peppers, but have so many jalapenos I don't know what to do with them. I've already made a ton of pepper jelly. Will definitely have to give this a try! ps - I have a great giveaway going on my my blog right now, do pop over! I would feel giddy too with those beautiful peppers! Thanks for sharing with us!! This year I tried roasting and canning the peppers with my pressure canner ... a lot of work. This would certainly have been easier. I've been freezing peppers for years, but I don't bother with the pan step. I just put a bunch, cut up into a gallon ziploc bag and freeze. The pieces pop apart real easily for me. I wondered how Trader Joe's did it and always thought it would be a good idea. It wasn't a bumper crop at our farm, but I might grow some next year so that I can do this. Also, good tip about the olive oil and sugar I always feel like soap and water don't do the trick with hot peppers. Love this idea! Thanks for sharing in the mommy club. I'm featuring you today at 1:30 on my Facebook wall!